I will miss my Mediterranean style garden when I vacation in Maui, Hawaii this week with my family, especially my pepper tree. I’m hoping my tropical destination will help me forget how I am missing my beautiful “stone-ruin garden” that I wake up to every morning. I created this vignette as an homage to the many ruin gardens my husband and I saw on our honeymoon in Italy many years ago. Every morning we throw open the double doors in our bedroom and this is our view. 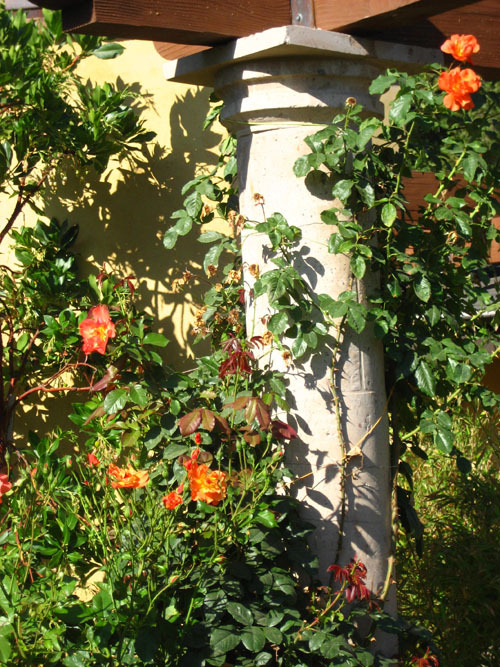 The sun rises behind theÂ columns andÂ illuminates the flight path of the hummingbirds as they hover and cross from plant to plant, enjoying their morning nectar. 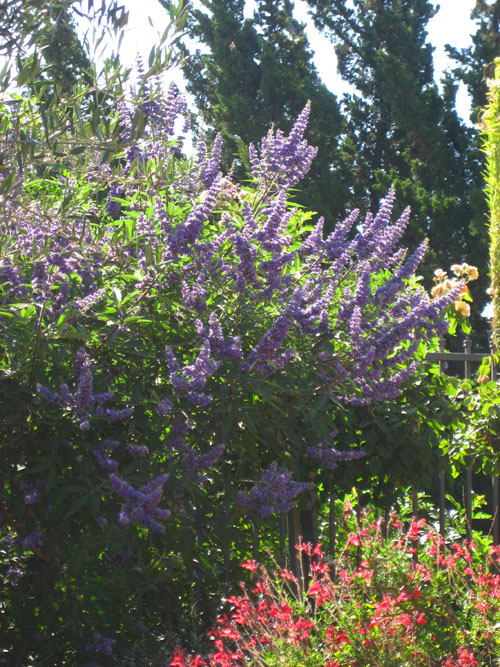 What fragrant tropical plant will enchant me as much as the familiar aroma of my Vitex, “chaste” tree and the welcoming musk of my ruby salvia greggii? Will the fragrance of the white ginger lei around my neck remind me of the romanticÂ apricot scented climbing roses that wrap around my stone columns back home? 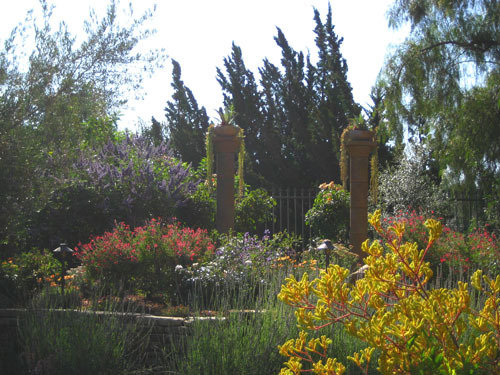 I’m blessed to have created my version of Eden at home with its dry butÂ surprisingly colorful gardens that are appropriate for the the Mediterranean climate of Los Angeles. I feel like I’m already on vacation everyday when I step outside my door. This will be my first visit to Hawaii and I wonder if it will alter my image of Paradise. Anyone come back a new gardener after visiting Hawaii? It’s best to create a raised bed area. 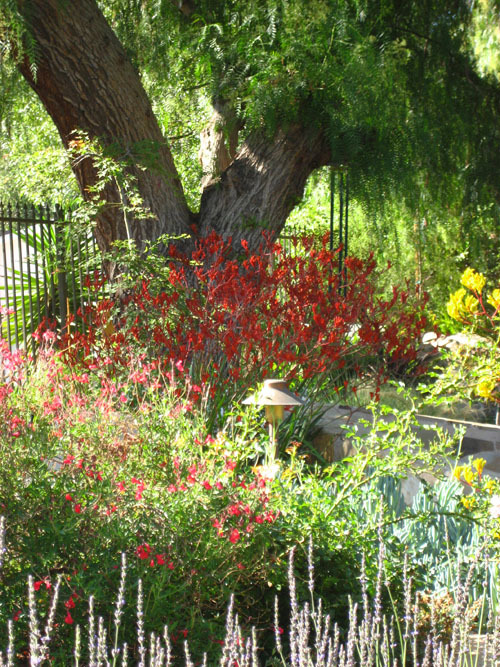 I would love to know how you managed to grow such a beautiful garden beneath your pepper tree! I have a pepper tree in my front yard and can’t manage to get anything to grow under or around it because the soil is so root bound. Did you create raised beds around your tree? Thank you so much for your pictures! It’s been challenging to find inspiration for what to do with my yard! The picture of the climbing rose really caught my eye. I had almost the identical roses growing in my garden in Mexico. They also had a wonderful apricot scent. Thanks for your wonderful site. You got tagged by me under my post 6 Important things about myself. I would link it here but typepad doesn’t do individual post urls and I didn’t want to advertise on your site. Anyway–you write up a post on 6 things that the rest of us don’t know about you. Let me know when it’s up. If you would like, you can link to 6 other people but it’s not necessary. I didn’t put this in my post–but I would like to know—what is the strangest thing ever to happen to you on the set of a show? Have you ever been on a set/someones home and your delivery of plants got mixed up–died–not get delivered? When was the last time you wore your hair short? Do you have pictures. Now that will give you a few things to think about. Let me go see your Maui pics. My first Hawaii installment will be posted tomorrow at 5:30AM! Thanks for your patience. By the way, what does “tagged” mean? I’m so uncool about these things. Me again—you and your Pepper Tree have been tagged by me. Guess I’m a bit too early for the Maui show. Next time you go to maui—take me along for the pics. You need an assistant who speaks southern–;) just in case you run into a fan you don’t understand. Hi to all my gardening friends who left me a message. Thanks for checking up on me. I’ll be posting on my Hawaiian vacation during the next few days. Hope you come by and see my photos and comments on my Maui garden experience! I admire the Vitex “chaste tree”. I love how you can click on the text to see the plants info. We probably do not see that too often as it says it thrives in heat. San francisco may be too cool for it, but I love it. It says it is fragrant,too. Now that is indeed a wonderful way to wake up in the morning. What I think is is interesting is the difference between the dry and wet sides of the islands. I love the rather “out of Africa “quality to the south of Maui with its “thorn” trees and scrub. We look forward to reading about the trip! I’m here with another group of frends. We are making all kinds of great remarks about your garden. They all love it. I hope Maui is beautiful and you are relaxing. Miss ya. OH Shirley—it is all so stunning. My goodness, I don’t know if I’ve ever seen such a pretty garden. Love it. I have salvia gregii about half that size and Chaste Tree is on my must get list for the new home. I can just imagine those columns with the sun behind. I have a patio door off my master and need you to come decorate the little deck that is out there. I’ve got a swing out there! Have a wonderful vacation. My son and his new wife went to Maui on their honeymoon and it ruined them. They didn’t want to come home. I think you already live in such a beautiful state of California. Ya’ll can grow anything. If you get a chance and you are bored on your Maui trip, stop by my gardening and kitchen blog. Iwant you to see my crook neck squash. I moved my award over there that you gave me. I wanted to keep my gardening and genealogy stuff seperate so I did a gardening and kitchen only blog. Hugs to ya and hope you have an awesome time. OH… I reregistered with Blotanical too. I think I can keep up now that I’m not working at the nursery. Welcome to The EdenMaker blog! I just left your blog and enjoyed your photos as well. I’ll be back to visit you and don’t be a stranger here! Great pictures! I found you on Blotanical, great blog!